For this episode of Nerd Lunch CT and I are still missing our comrade-in-arms Jeeg as he moves all of his junk North for a new job. 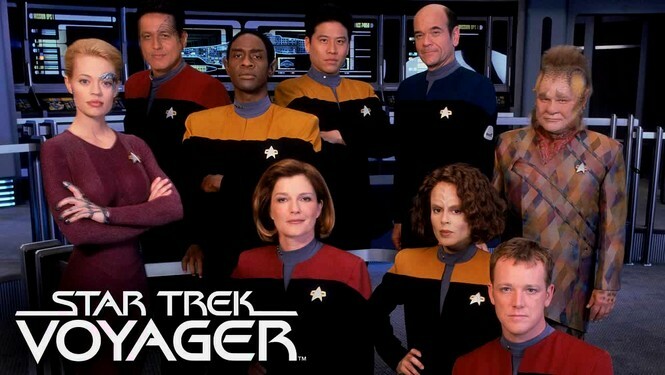 To replace Jeeg, we brought back Rob Graham and we take this opportunity to talk about one of the more maligned Star Trek franchises, Voyager. We start with a ground level reconstruction of the concept of the show and we talk about the things in the show that worked, and the many plethora of things that did not work. We recast many of the roles and play around with the concept of Star Trek: Lost in Space. I honestly think we made it better. This entry was posted on February 5, 2013 at 9:26 am and is filed under podcast, pop culture, Star Trek, TV shows with tags Nerd Lunch Podcast, podcast, podcasts, pop culture, Star Trek, TV shows. You can follow any responses to this entry through the RSS 2.0 feed. You can skip to the end and leave a response. Pinging is currently not allowed.